As now is the mango season, you can find very cheap and sweet mangoes everywhere. It is also the best time to use the mangoes for bakes or desserts. 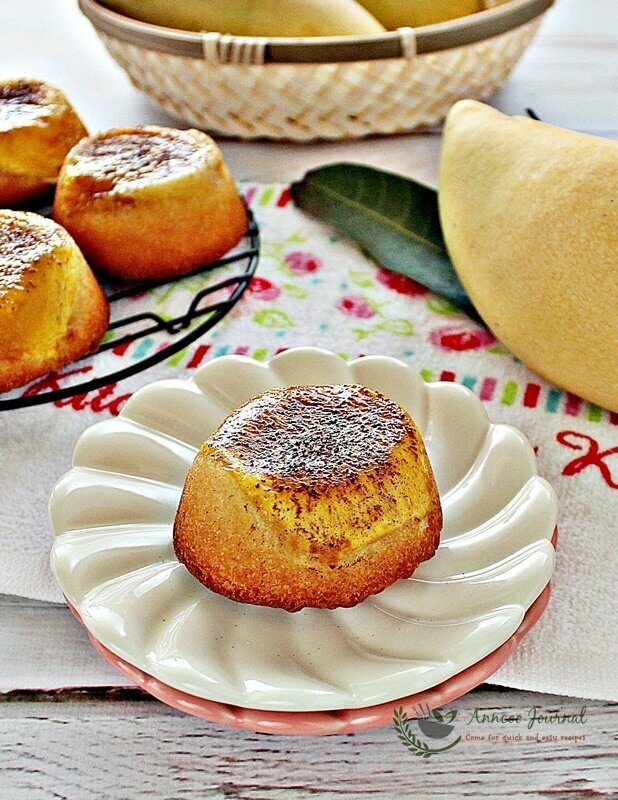 As I’ve made the mango pudding before, this time around I made Upside Down Mini Mango Cakes. It is a very easy recipe to follow and very fragrant with the combinations of coconut milk, desiccated coconut and ground almond. So good to serve them warm and you can taste the mixed flavours of the cake in your mouth. Definitely a keeper! Preheat oven to 200 degrees C. Grease muffin pan and line with with mango slices. Put butter and sugar in a bowl and beat until light and creamy. Gradually add the egg, beating well after each addition. Stop machine fold in the sifted flour with a rubber spatula, then add the almonds, desiccated coconut and coconut milk, mix well (do not overmix). Spoon batter into the muffin holes and bake for about 20 minutes or until a skewer comes out clean when inserted in the middle. Rest the cakes for 5 minutes in the muffin pan and turn them out on the wire rack. Glaze with some apricot gel on top of mango and dust with little cocoa powder. Serve cakes warm or cool. Hi Ann. Wow! Such lovely mini cakes you have baked! Really make me drool. 😀 May I know if this lovely cake will be sweet (210g sugar)? Because my mum cannot take too sweet but she is a mango fan and I would like to bake this lovely cake for her. Therefore, may I know can I reduce sugar? Hi San San, Thanks for your compliment. Yes you can reduce 30-50g of sugar if you don't like the cake to be too sweet. hi ann, i saw this in fb last week..they are truly gorgeous..can imagine how fragrant they are with the combination of the ingredients. Hi Ann! Thanks so much for sharing this recipe at the right time! I tried baking this on Vesak Day (since i'm free), and it turned out well! Yummy! I was so worried it will not turn out well cos the batter looked a lil weird. But it taste good and looked good after coming out of the oven! I've also tried using canned peach and canned mandarin oranges! Yummy! (didnt add in desiccated coconut though). I guess this is better than pineapple upside down cake! Awesome. Lovely and tasty cakes.Thanks for sharing Ann. My family is a big fan of mango. Recently the mango tree in our backyard bear a lot of fruits. I love the upside down cake, and it's mini and mango in it! Perfect for kids' snack as it's not huge. I actually have mini muffin pan but I rarely use it. I decided I'll start using again with this recipe! Pinned! manggo i like. seem like is a nice cake. Wow! Mango is my favorite! Would love to try this unique looking cake! The ingredients combinations sounds delicious! Looks wonderful! We love mangoes! This would be a lovely tea-time snack! I wish the mango we have over here taste as great as yours! These cakelets look marvelous, Ann. The combination of mango and coconut is simply perfect! This is special. I'd like to give it a try if I can still get hold of some nice mangoes. Never thought to put mangoes in an upside-down dessert. These look amazing & I love that they're made with almond flour. I have made similar mango cakes. They are so yummy and moist! Have a great day! may I know why you recommend Kara brand coconut milk? Is actually up to you to use any brand of coconut milk. I just typed out what I'd used. I love pineapple upside down cake. These look delicious. They look so cute. I believe this is a lovely combination. What a pity, can see but cannot get to eat! Ann! We all love mangoes so this cake is for us!!! Wow! Wow! Wow! By the way, what is apricot gel? Does it make the cakes taste better or what is for? Is it ok to omit it as I don't have it Thanks! Ai Li, the mangoes will not as sweet as before baked, so need to brush some apricot gel on top with a little sourish and secondly the glaze make the cakes look shiny. You can also use the lime syrup to brush on it or leave it as it is. Ann, thanks for explaining! What do you think I were to use lime juice mix with some sugar and some hot water? Can I buy the Apricot gel from PH if not where? Thanks! Ai Li, Apricot gel is available at PH. Since you don't use gel quite often, you can make the lime syrup as glazing. 100ml water with 40g sugar and 1 1/2 tbsp lime juice. Boil the syrup for together for 1-2 mins and leave to cool. Ann, thank you so much!!!!!! Ann, you are making me drooling, how to on diet like that lol. Ann, these are very tempting mini cakes and I love mangoes! Ann, you are making me salivating now, can look but can't touch, hahaha! I like this upside down idea only becoz you can reach the mango slices before the cake first. You know lah, I'm a mango mania, hehehe! 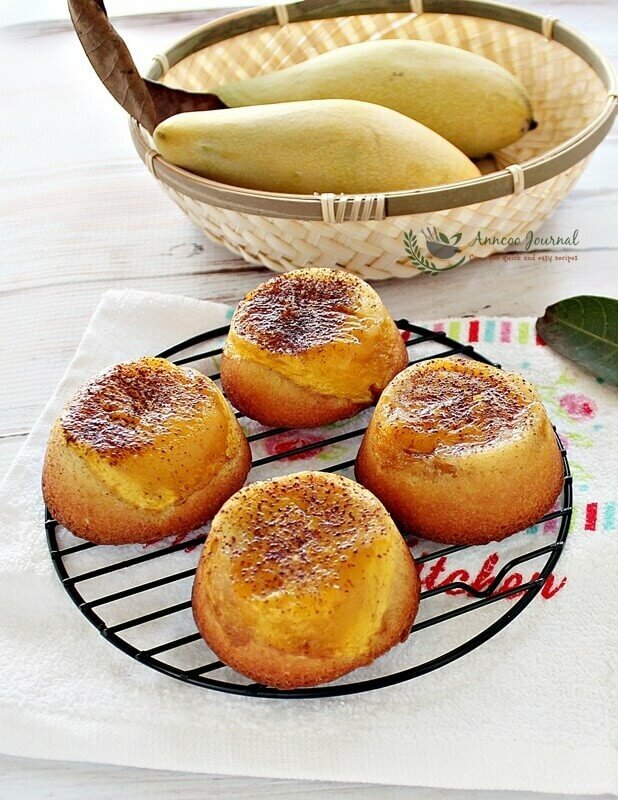 wow, this lovely mango upside down cakes is full with ingredients, mangoes, almond, desiccated coconut, coconut milk, chocolate powder…yummy, I want 2!